Clubs run termly and finish in the penultimate week of term. Letters go out termly so children can opt into a club. We do ask children to commit to the club for the term and if they choose not carry on with their chosen activity their space is allocated to another child. Our clubs are an opportunity for children to take part in an enriched activity that they are interested in and develop their skills. 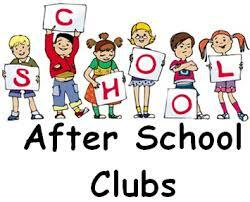 There is no charge for any of our clubs but children may only take part in one club per term.